This week has seen what may be only a short delay towards climate legislation in the USA, but a potential long-term hold in Australia as the Rudd government has shelved plans for an emissions trading scheme, at least until 2012/2013. Both countries are struggling with bipartisan support for action. As a result, the notion of a broad response to the Copenhagen Accord by developed countries looks increasingly unlikely, at least in the run-up to COP16 in Mexico and maybe even COP17 in South Africa. With action in developed countries slowing down, it is hard to build the case for comprehensive action globally. A delay of the sort that Australia now faces means that there will be little legislative framework of any substance in place to deliver on their national 2020 goal. The same may well be the case in the USA if the proposed Senate Bill doesn’t appear soon. Whilst the Australian government has said that this is a delay and that may well be the case, the reality is that 2012 or 2013 legislation could translate to a 2014 or even later start-up of the trading system. As we have seen in the EU-ETS, a 3-5 year bedding-in period should also be expected during which time the trading system appears as a soft touch on the economy allowing businesses and consumers to begin to adapt to the change. So a delay to 2012 for legislation means 2014 for startup and 2018 or 2019 before it really begins to bite. Such a timeline is not commensurate with the challenging 2020 goals that have been pledged by most developed countries in the weeks after Copenhagen. These will only be met with comprehensive economy wide action delivered through a coherent policy framework, such as now being discussed in Washington and which had been tabled in Australia. Inter-dependencies may also become a problem. In announcing the delay in Australia, the government pointed out that it may be more opportune to introduce climate legislation domestically once the international position firms up and a more coherent global approach is closer to reality. But some nations have linked their commitment for action internationally with their ability to deliver legislation domestically, so there is a real Catch-22 developing. 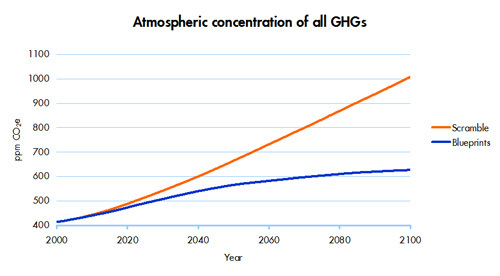 In 2008 Shell published two energy scenarios for the period to 2050. They were very different in terms of the global response to carbon emissions. In the Blueprints scenario, a comprehensive global approach arises from local, national and regional action as a series of bottom-up coalitions build towards a solution. Bipartisan agreement is a critical component. More importantly, the scenario assumes robust carbon pricing is prevalent across the OECD (and beyond in some instances) in the period 2010-2020 which in turn allows the world to turn the corner in terms of emissions in the 2020s. The alternative world, called Scramble, sees much more focus on meeting energy demand as a single goal, with little real action on emissions. Energy nationalism is the flavor from 2010-2020, rather than real international cooperation. In the decades that follow governments need to make difficult decisions on energy and climate issues given the lack of progress in dealing with them early on. As a follow-up to the scenarios Shell worked with MIT to look at the climate implications of the two scenarios and this was published in 2009. The actions taken in Blueprints lead to a clear stabilization in atmospheric CO2 and other greenhouse gases, albeit at a level above that now advised by the science community (note that we are already at 450 ppm CO2e when considering all GHGs). But Scramble sees GHG levels in the atmosphere continue to climb through the whole century, ending up at over 1000 ppm and still rising by 2100. 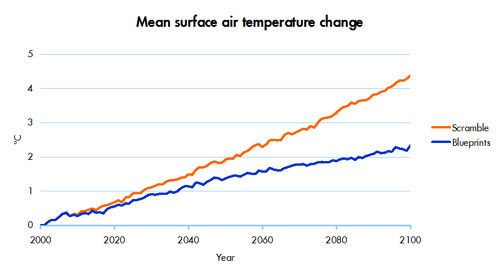 In terms of temperature, the difference is a cause for concern. Whereas Blueprints shows clear signs of the temperature impact leveling out at somewhere between 2 and 3 degrees C, Scramble has us heading to 5 degrees C by the end of the century. A key learning point from the scenarios is that action in this decade is very important. Developments this week would seem to be counter to that need.